“LP” is an abbreviation for liquefied petroleum. The terms “LP-gas” and “LPG” are often used as an abbreviation for propane. While propane tanks are very heavy and sturdy, they can begin to leak, due to age or damage. You may not know this, but removable DOT propane tanks (like the 20 lb BBQ tanks) of 100 pounds or less, have an expiration date. This expiration date is 12 years from the date of manufacture. Once the 12 years are up, these tanks should be traded for a replacement, or inspected for requalification for an additional five years. 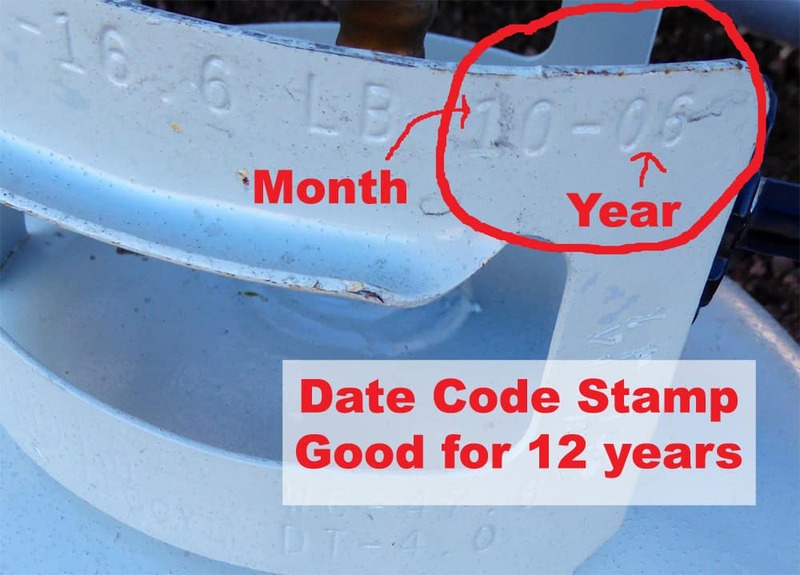 Date code on a DOT 20 lb propane tank. Removable DOT propane tanks are found on travel trailers, fifth wheels, truck campers, and some small motorhomes. DOT tanks can be mounted in exterior compartments, or on propane tank holders on the tongue or bumper of a trailer. On the other hand, the propane tank on your motorhome is an ASME tank. These are permanently mounted, horizontal tanks. ASME tanks do not require recertification, but they should be inspected periodically for rust and dents. Eventually, the propane tank on your motorhome may need to be replaced. It’s recommended that once a year, have the entire propane system inspected for leaks, rust, and regulator pressure settings. This inspection should include all propane appliances such as the stove, refrigerator, furnace, hot water heater, etc. On board ASME tank on an older motorhome. 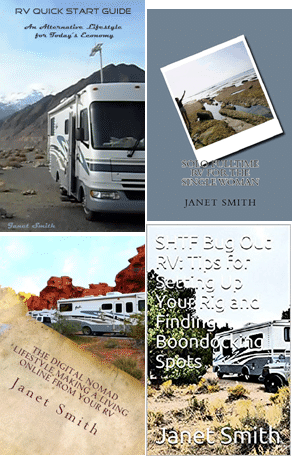 ASME tanks on motorhomes can vary, depending on the size of the motorhome. While a small Class B or C might have a single 20-pound ASME tank, it’s not unusual for very large Class A motorhomes to have propane tanks that can hold 80-100 pounds of propane. 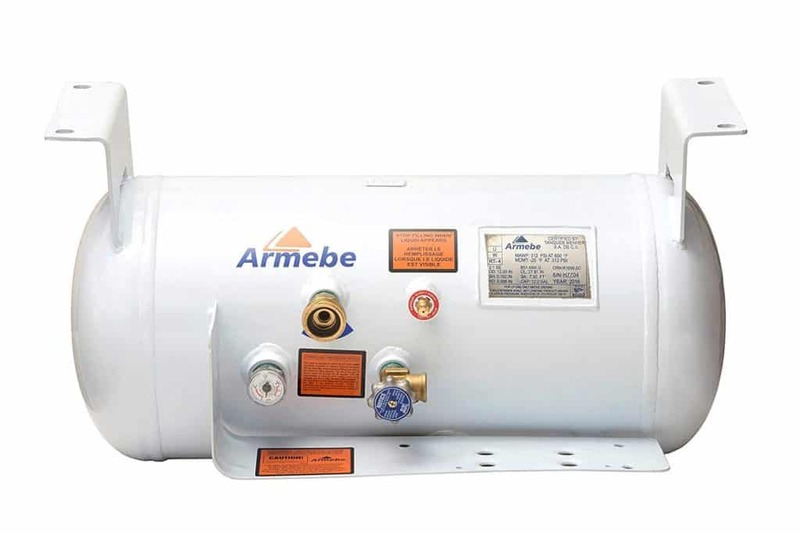 New ASME propane tank for a motorhome on Amazon. Propane is stored in a liquid state. But once the tank is connected to the RV’s propane gas system, and the valve is opened, the liquid propane boils, and leaves the tank as a vapor. The RV’s pipes are then pressurized with the propane vapor. Propane expands when heated, and when propane expands, pressure inside the tank increases. Without room for expansion, the pressure in the tank could reach dangerous levels, or force liquid propane into the system. ASME tanks and DOT tanks have special overfill protection. The pressure in a DOT or ASME tank is determined by the volume of liquid propane and the temperature. The tanks are built to withstand the pressure normally associated with propane, but if excessive pressure develops, a relief valve opens, to allow the vapor to vent. DOT cylinders should not be stored in enclosed areas, such as a garage or inside a vehicle, where vented vapor could accumulate, and possibly ignite. DOT cylinders on fifth wheels are generally stored in special compartments, that have venting for vapor to escape. Travel trailers generally have the tanks on the tongue. Propane alarm for an RV on Amazon. 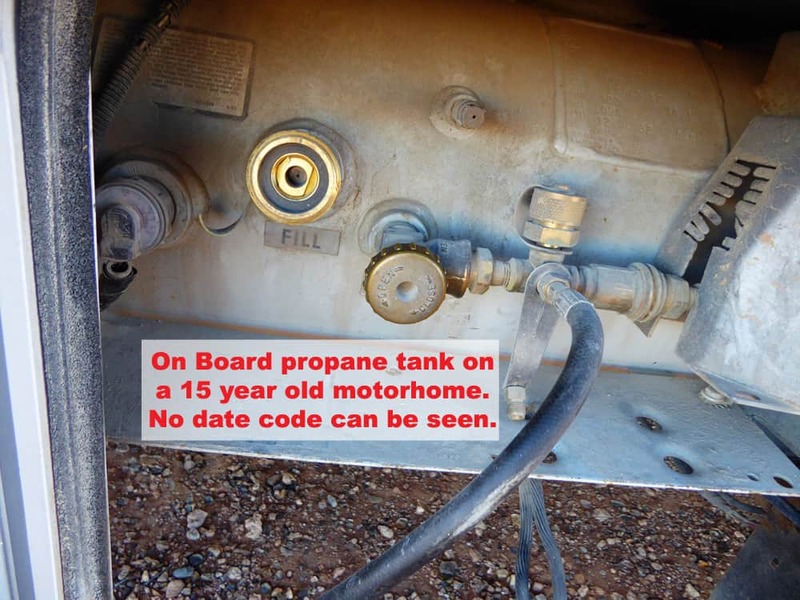 Another propane related item that can expire is the propane alarm inside your RV. These alarms are good for 5 years. If your alarm has expired, it will begin to beep and chirp randomly, which may lead you to believe you have a leak. But if it does begin to chirp, have your RV checked for propane leaks. If it is an expired alarm, it can be easily replaced. These alarms are installed near the floor, as propane is heavier than air, and will linger near the floor. Beneath the stove, or near the propane refrigerator is a common place for it. One thing to note, you can also get false alarms from hydrocarbons, which are present in items like hair spray and cleaning products. So it would be wise to avoid using these items near the alarm.